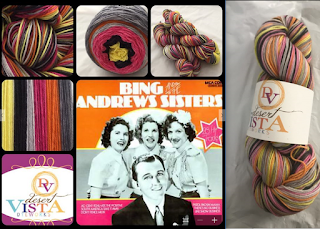 Life of a Knitphomaniac: It's June Already? Wow it has been a crazy week.....and it is already June....where has the time gone? How have you been? I have been great......I have a few stash enhancements I am going to open with. I bought a new bag set from Darlene.......Now, her shop is closed while she rides her motorcycle along with her hubby (on his own motorcycle) and their dog (she rides with the hubby) up North to Montana, Idaho, Washington, Oregon, etc...(Yes, she has left me for over 2 weeks 🙁.....I am not sure what I will do with myself).......but this fabric is just the cutest, so at least I can look at all my awesome bags and she is with me in thought! I also got some hostess gifts from Qianer at HiyaHiya. She is so amazingly generous. With Darlene and I starting a podcast together, I will no longer be doing any of the moderation for the HiyaHiya group (I finish out my last KAL at the end of June), but Qianer has agreed to donate some prizes to the podcast.....she is fabulous! Thank you Qianer! The pink the "Bing and the Andrews sisters" is not as pink as was on her website....so I emailed her and hopefully she can re-dye the pink. I finished the crochet blanket for Paige. I thought I would have to go to 19 stripes like I did for Chris' blanket but she said 17 stripes was enough...it is 77" x 64" just laying flat....no stretching. She loves it! Other than that blanket.....the rest of the week (up until Saturday) was all about the JoJi Mystery Wrap! I kinda slacked on the Memorial day weekend and hardly worked on it that weekend (I was mostly crocheting on Paige's blanket)....so I was really kind of just starting on clue 3 last Tuesday...then Thursday clue 4 came out....so I had lots of catching up to do. On Tuesday there was a big rain storm and I had no power at my home. Since I could not cook (gasp) and ordered in pizza and knit with my portable battery operated Clever Scope...Yippee! I am not quite done with clue 3 yet...I have one triangle done to clue 3 plus 2 rows of clue 4 done....but on the second triangle, I still have about 17 rows on clue 3 to finish. On Saturday I got my Miss Babs Second Destination Package....we are going to Peru Baby! I am in love with this kit. Now, we had a color choice on this. The color choice was "Pink" or "Not Pink" and I went with Pink.....come to find out that the Not Pink option is ORANGE. I thought I was going to be really bummed not to get the orange....but I was wrong....I LOVE THIS PINK AND BLUE! (the pattern is called Llama Drama by Casapinka). This smile made it worth all 775 pieces! Well, that is all I have....Have a great week everyone!